This is a very good technique I learned from chef Chloe's website, it make you use coconut milk in dishes that normally require cream to make them dairy free. Don't be scared of trying this if you don't like coconut, because when you put it together with other ingredient like chocolate, you can't really taste the coconut, I have served this for a few friends that didn't like coconut that was all surprised to find that the dishes was made with coconut milk. 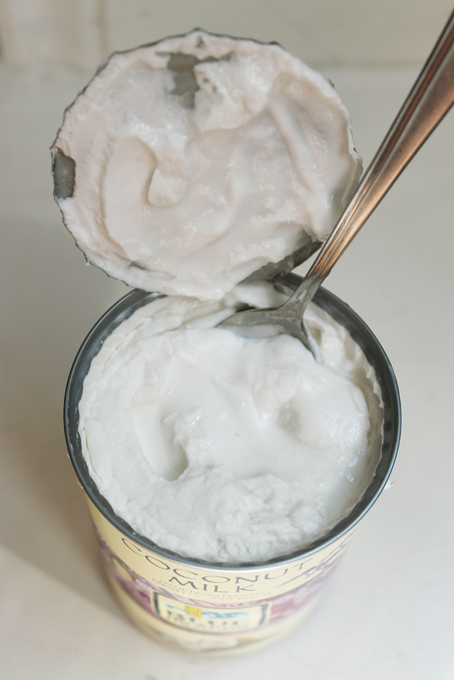 It is very easy, make sure not to shake the can of coconut milk, place it in the fridge for a few hours or overnight, open can and scoop out the creamy coconut milk until you get to the coconut water (discard the coconut water or use in cooking). I can recommend the Blue Dragon Organic coconut milk, as it is really creamy and smooth when using in deserts. If you are finding my blog useful, please sign up and show your support.